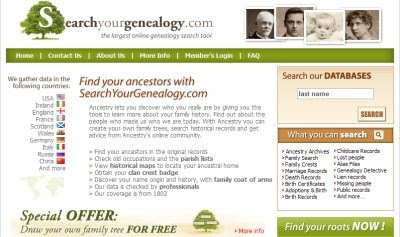 Mike Ward, PR Director for Ancestry.com and parent, the Generations Network, warned the public today of websites targeted to the genealogical community with alleged fraudulent intentions. Said Ward, "from what we can tell, these sites are nothing more than a series of web pages with links to other services. These sites, in our opinion, are clearly fraudulent." According to Ward, "it appears the site colors, fonts, and pictures on at least one site are designed to mislead people into believing the site is related to Ancestry.com." Judge for yourself. 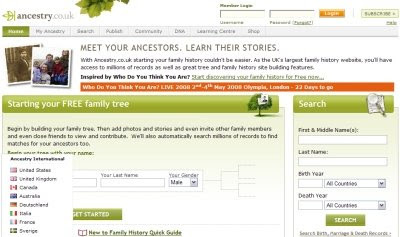 Below you can see the SearchYourGenealogy.com and Ancestry.co.uk websites side-by-side. Notice colors, flags, trees with free family tree offer, photos and more. with pop-up showing flag links to other Ancestry websites. The names of the other two websites mentioned, Ancestry-search.com and Australian-Ancestry.com could possibly cause confusion among consumers. The full text of the announcement can be read on the Ancestry Blog. Personally I think Ancestry has added to confusion with their many sub sites that link to ancestry.com. I can't tell you how many times I've been searching for information and find what appears to be a unique site think may be really worthwhile only to wind up at Ancestry's pay wall. You are so right. I've surfed into a few sites and found much of the same. Then there are those that you come across and read the fine print at the bottom. "This site is a member of the MyFamily.com Network."